Purchase a 1 oz Swiss of America Silver round from our online store and enjoy the lowest price, guaranteed! This edition of Draper Mints “Swiss of America” rounds are known for their unique 'Rolo' shape. Making this edition of Swiss of America highly sought after for their low mintage and their unique dimensions. The obverse features a chateau in the foreground with a high peaked mountain in the background, with “Swiss of America” displayed in bold font across. The reverse contains the companies name, its purity and its weight encapsulated by rounded indentations. These well struck rounds remain highly sought after due to their liquidity and vintage appeal. Build your wealth in ounces and secure yours today! Anverso A chateau with the "Swiss of America" title. Reverso the rounds weight, purity, and issuing company. A chateau with the "Swiss of America" title. the rounds weight, purity, and issuing company. 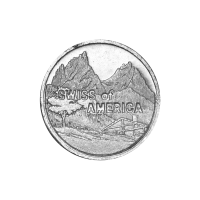 1 oz Swiss of America Silver Round Purchase a 1 oz Swiss of America Silver round from our online store and enjoy the lowest price, guaranteed! This edition of Draper Mints “Swiss of America” rounds are known for their unique 'Rolo' shape. Making this edition of Swiss of America highly sought after for their low mintage and their unique dimensions. The obverse features a chateau in the foreground with a high peaked mountain in the background, with “Swiss of America” displayed in bold font across. The reverse contains the companies name, its purity and its weight encapsulated by rounded indentations. These well struck rounds remain highly sought after due to their liquidity and vintage appeal. Build your wealth in ounces and secure yours today!